This revised GPR both updates the original material and introduces new topics. In particular, it presents a more detailed and refined approach to undertaking risk assessments specifically oriented to field practitioners. It also outlines a more comprehensive means of implementing an ‘active acceptance’ approach, as well as examining in detail deterrence and protective approaches, including maintaining a low profile and using armed protection. New topics include the security dimensions of ‘remote management’ programming, good practice in interagency security coordination and how to track, share and analyse security information. It provides a significantly more comprehensive approach to managing critical incidents, in particular kidnapping and hostage taking. Issues relating to the threat of terrorism are discussed in a number of chapters within the revised edition and have been purposefully mainstreamed Introduction rather than siloed into one chapter. 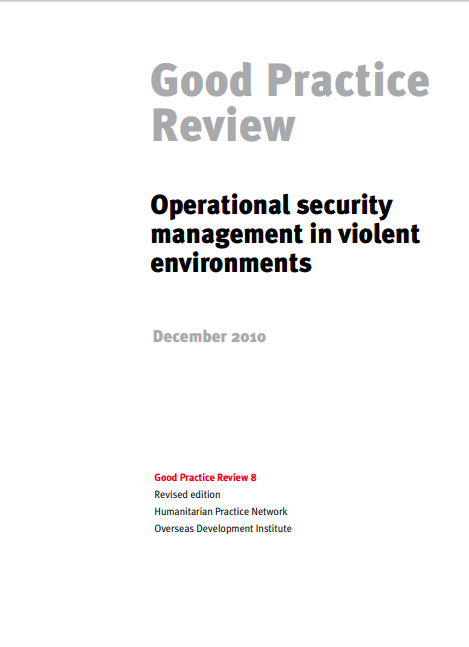 A series of annexes examines issues such as the changing security environment for humanitarian action, the role of private security providers, insurance provision, and the role of official donors in supporting security management.